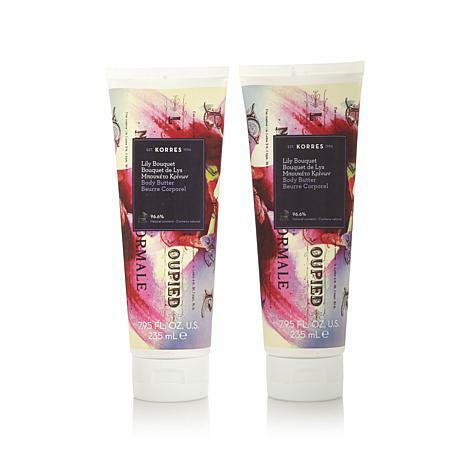 A field of violets, roses and jasmine await your senses with this indulgent body butter duo. Bask in the fresh floral scent as the luxuriously moisturizing formula pampers your skin, leaving it looking smooth and dewy. Let it inspire your natural beauty. I just love this product. It smells amazing & always leaves my skin feeling soft. It absorbs well into my skin and does not feel sticky. I missed using Korres body butters, so I recently bought the Cashmere Rose scent. I think I've heard Laura Baker, Liz Folce as well as the HSN hosts say in the past that once you use Korres, you never go back! These butters really are amazing and provide real moisture and hydration! 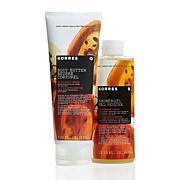 Some lotions can just give the appearance of moisturized skin, but with Korres, it's real! Cashmere Rose is such a beautiful scent, and someone even told me how beautiful I smelled! This is the BEST body cream. I have very sensitive skin and allergies so I was taking a chance to buy but was very pleasantly surprised. No problems just smoother, softer,skin. I have used this on my neck and face with no breakouts, again smoother and really moisturized. Delicious soft scent! Clean fresh fragrant. Leaves skin soft & supple without feeling greasy. Have been using korres products for years & I always come back & purchase more. This body butter is fabulous. It smells like vanilla ice cream with fresh blue berries on top. It is lush, creamy, and makes me smell delicious.